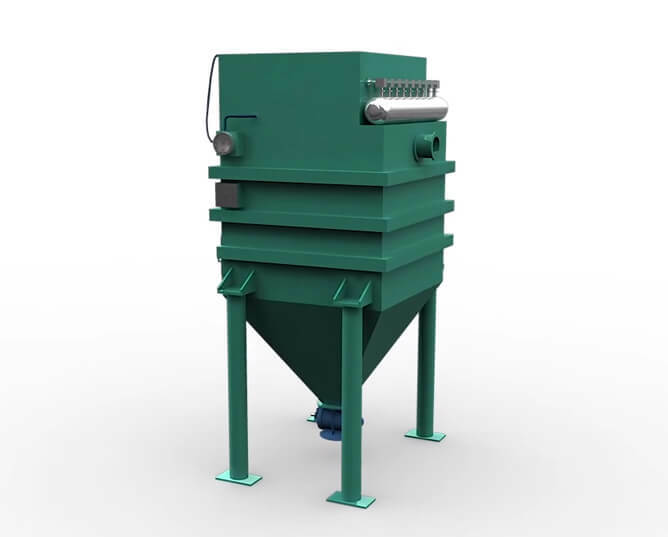 Filter Concept is manufacturer of Pulse Jet Dust Collection system for various Industries requirement for air quality improvement and enhancing the quality of air released by collecting dust and other impurities from air or gas by removing particulate matter from the air and environment. We are a manufacturer of highly customized units to accurately match your Application requirements with customized ducting solutions along with our dust collectors for your specific dust collection requirements. 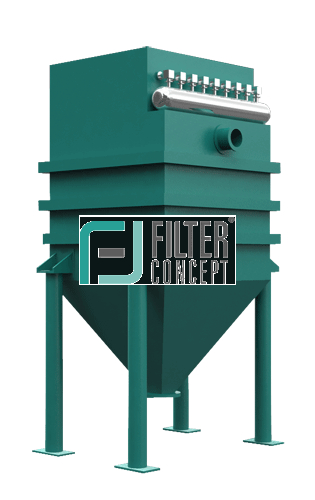 The dirty or contaminated air enters the dust collector through the inlet and passes through a number of filter cartridges/Bags (before the contaminated Air passes through the Filter Bag/Cartridge; baffle plate works as a protecting layer to control/retain heavy particles, which protects filter bags/cartridges to get in touch with heavy particles and damage caused by it) which retain the dust particles on the exterior surface while allowing clean air to pass through the outlet. As the collector operates, the collected dust begins to form dust cake, which eventually diminishes the porosity of the filter cartridges. As the pressure drop increases the ventilation volume of the collector decreases. To maintain a moderate pressure drop, the cleaning cycle is employed to provide continuous cleaning of the filter Bags/cartridges. The cleaning system consists of a Sequential time controller, which actuates Solenoid Valve and the Compressed Air Header. These Compressed Air Header momentary burst or pulse of high pressure compressed air through the blow pipe into the filter tube. This Pulse of air creates reverse flow of air, which expands the filter cartridges to remove the collector dust. The cleaning procedure occurs on a row‐by‐row basis therefore only a fraction of total filter air is interrupted for cleaning allowing continuous ventilation. The dust cake when pulsed from the filter cartridges falls directly into the bucket at the bottom where it is removed. Cartridge Housing, Baffle Plate, FILTER Bags, Sequential time controller, Solenoid Valve, Compressed Air Header, Safety Valve, Drain Valve, Pressure Gauge, Acrylic Manometer.